The MSFL All-Star Game will be played on Sunday, October 13th, 1PM, at Riverside-Brookfield High School — the same location as the Eastern Conference Championship. Congratulations to all of the Mustangs selected as All-Conference or Honorable Mention! Congrats to the Madison Mustangs for winning the West over the Rush last night (Saturday) in a hard fought win keeping the Rush from scoring from the one on eight attempts. Next week the Championship game will not be played due to rain moving into the area Saturday afternoon in the Chicago vs Indiana Mustangs game. The game was being played early in the afternoon due to an event being held inside the school…at Riverside Brookfield High School. The parking lot and field had to be cleared by 5 o’clock and with the rain moving in this made this impossible to finish the game. Despite being down 34-6 this is a playoff game and the game must be played out till the end. Bigger deficits have been made up in the history of MSFL playoffs and to call a game in the playoffs with both teams not agreeing to it is not a fair call despite what people feel about either team. The league banquet will still take place Saturday night after the game between the Chicago Mustangs and Indiana Mustangs at 7:30 pm at Holiday Banquet located on 103rd and Roberts Rd. League awards will still be issued at the conference championship trophies will be at the event. All star updates will be posted today (Sunday) regarding the game as of now the game will still be played on Sunday, October 13. The Indiana Mustangs (7 – 3) knocked off previously undefeated Indiana Generals 18 – 9 at Arsenal Tech High School during round two of the Mid States Football League playoffs. The Mustangs were without the services of their starting quarterback and offensive coordinator, Eric Hooks as he was attending his wedding on Saturday which also resulted in a number of Mustang players arriving late to the game. The Generals took advantage of the missing Mustang players and defensive coordinator by scoring on their opening drive to take an early 7 – 0 lead. Following this drive, the Mustangs defense shutdown the explosive Generals’ offense with big hits by Dontae Crook, Jovan McCray, Dontae Hart, Junior McKinnie, Carlton Summler, Paul Carter and Anthony Weather. The Mustangs offense was led at quarterback by former 2005 Indiana Mr. Football Dexter Taylor (Warren Central and Marian U.) and All Conference defensive back Paul Carter (Northwest and U. of St. Francis) as both players did a masterful job sharing the quarterback duties especially considering the Mustangs were also without their all-star center Mario SiFuentes. The Mustangs offensive strategy was simple – eliminate turnovers, shorten the game by running the football and keep the score close. The Mustangs had five turnovers in their earlier loss to the Generals at the end of the regular season, and neither quarterback threw an interception on Saturday night. The Mustangs used running backs James Sharp, Jerimy Finch, Erick Harper and Jovan McCray to surprise the Generals with a running game. The Mustangs scored late in the first quarter on a two-yard run by Jerimy Finch (Warren Central and Marian U.). The PAT was blocked, and the Generals held onto a narrow 7 – 6 lead. In the closing minutes just prior to halftime, the stadium went completely dark similar to last year’s Super Bowl, forcing a twenty-minute delay before the lights could be restored. The Mustangs were unable to capitalize coming out of the second half with the football as the offense continued to struggle with execution and communication problems. On the Mustangs second possession of the second half, Dexter Taylor found Paul Carter on third down and long, and Carter made a spectacle acrobatic reception only to have the football jarred loose at mid-field. However, the Mustangs were able to rely on their stingy defense to shutdown the rejuvenated Generals. Early in the fourth quarter, Paul Carter scored on a quarterback sneak to take a 12 – 7 lead. The Generals came roaring back on their next possession when the Generals receiver beat the Mustangs secondary for a forty-yard reception. While nearly to the end zone, the Generals receiver was tracked down from behind by Anthony Weather who stripped the football loose as it fumbled out of the end zone, forcing a touchback and giving the football back to the Mustangs. The Mustangs scored on the next possession when Paul Carter found 6’4” Kyle Wimberly (Warren Central) for a twenty-yard touchdown reception and an 18 – 7 lead. With three minutes left in the game, the Mustangs took a safety, and the defense stepped up again led by a first down sack by Dontae Crook and another jolting hit by Junior McKinnie. The Mustangs stopped the Generals on downs to preserve the victory. Jerimy Finch, Anthony Weather and Jovan McCray each finished the night with an interception. The Mustangs will now advance to the Eastern Conference Championship to face the Chicago Mustangs next Saturday. 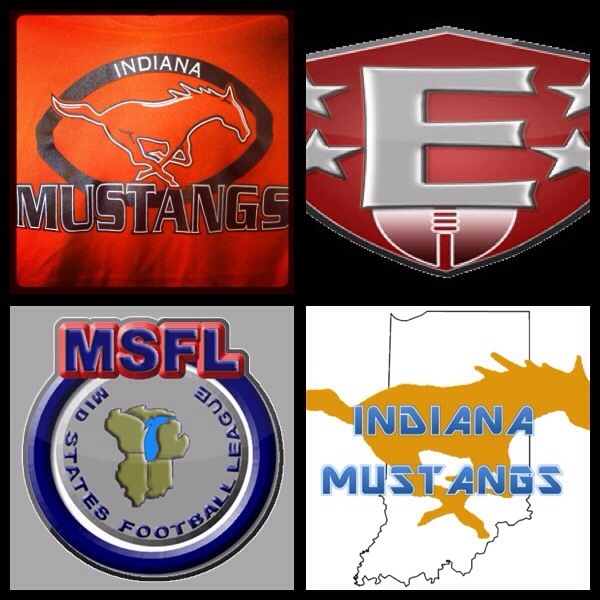 The Chicago Mustangs only loss this year was to the Indiana Mustangs 41 – 38 in a shootout at Arsenal Tech HS. The Chicago Mustangs defeated the Chicago Thunder 16 – 7 in their playoff game, and they are looking forward to hosting the rematch in Chicago. Ironically, the MSFL has three teams using the name of Mustangs, and all three teams won their playoff games last weekend while two previously undefeated teams lost including defending league champions Racine Raiders. The Indiana Mustangs (6 – 3) will play the number one-seeded and undefeated Indiana Generals (8 – 0) on Saturday, September 28th at Arsenal Tech High School. This game is the 2nd Round of the Mid States Football League playoffs. The gates will open at 6 PM, and kickoff is scheduled for 7:30 PM. Tickets are $10, and children 13 and under are free. 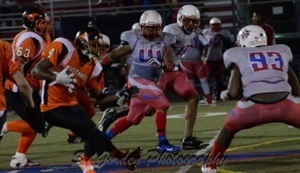 The Mustangs are coming off a big win last weekend 36 – 30 over the Lincoln-Way Patriots. The Patriots scored 16 unanswered points with five minutes remaining to tie the score in the final minute of play. Mustangs quarterback Eric Hooks came up with his own last drive heroics by finding Kyle Wimberly for a 49-yard touchdown strike with just 47 seconds remaining to preserve the win. The Generals enjoyed a 1st round bye last weekend. During the regular season, the Generals defeated the Mustangs 28 – 14 with the Mustangs giving up five turnovers including an interception for a touchdown late in the third quarter. Provided the Mustangs can eliminate turnovers, this should be an exciting playoff game with both teams loaded with an abundance of local talent. The winner will advance to the Eastern Conference Championship next week. The Indiana Mustangs improved to 6 – 3 to survive a fourth quarter shootout with the Lincoln-Way Patriots on Saturday night at Arsenal Technical High School in Indianapolis with the final score 36 – 30. The Mustangs will now advance to the second round of the MSFL Playoffs in a rematch against cross-town rivals the Indiana Generals. The Mustangs opened the scoring with a 41-yard field goal by kicker Matt Midkiff. The Mustangs also scored two rushing scores on the night with a quarterback sneak by Eric Hooks and a 29-yard run by James Sharp with gave the Mustangs a 23 – 14 lead with less than six minutes remaining in the game. On the Patriots next drive as they moved into scoring position, cornerback Paul Carter picked off Patriots quarterback Tony Powell in the end zone and returned the interception for a team record breaking 109-yard interception and a comfortable 30 – 14 lead. It appeared that the Mustangs would secure a decisive victory. However, the Lincoln-Way Patriots offense showed no quit led by the team’s elusive quarterback Powell who engineered two quick touchdowns and two-point conversions in the final five minutes to tie the game at 30. With 1:07 left on the clock and no timeouts, the Mustangs began their final possession on their own 30-yard line. After a quick toss to Paul Carter, who got out of bounds to stop the clock at the Patriot 49-yard line with only 47 ticks left in regulation. The Mustangs needed another big play to avoid playing an overtime period short-handed due to injuries. When it counted most, quarterback Hooks and the Mustangs offense delivered. Thanks to a great effort by the make-shift offensive line, Hooks had time to survey the field and find Kyle Wimberly for a 49-yard scoring strike in the middle of the field with 40 seconds on the clock. The Mustang defense, led with “pick-sixes” by Carter and Carlton Summler and huge hits by Jeremy Finch and Junior McKinnie, were able to stop the Patriot offense in crunch time to seal the win. On Lincoln-Way’s final drive, great pressure from Dontae Crook, Dontae Hart, Michael Cupp and Eric ‘Smooth’ McKinney forced an intentional grounding call on 2nd down, putting the icing on the cake with loss of down and a ten-second run-off of the game clock. Catch the game in its entirety at http://www.meridix.com/mbp/general/index.php?liveid=ChicagolandPrepReport&recordid=44512&event_position=&event_type=&start_time=&stop_time=. For more information on the Mustangs, please contact either Rich Castanias @ 317-379-4669 or James Stamper @ 765-681-1327. The Indiana Mustangs (4-1) have not played a game since August 3rd’s 13-6 victory on the road at Lincoln-Way. The scheduled game against the Lake County Steelers resulted in a forfeit win for the Mustangs on August 17th. 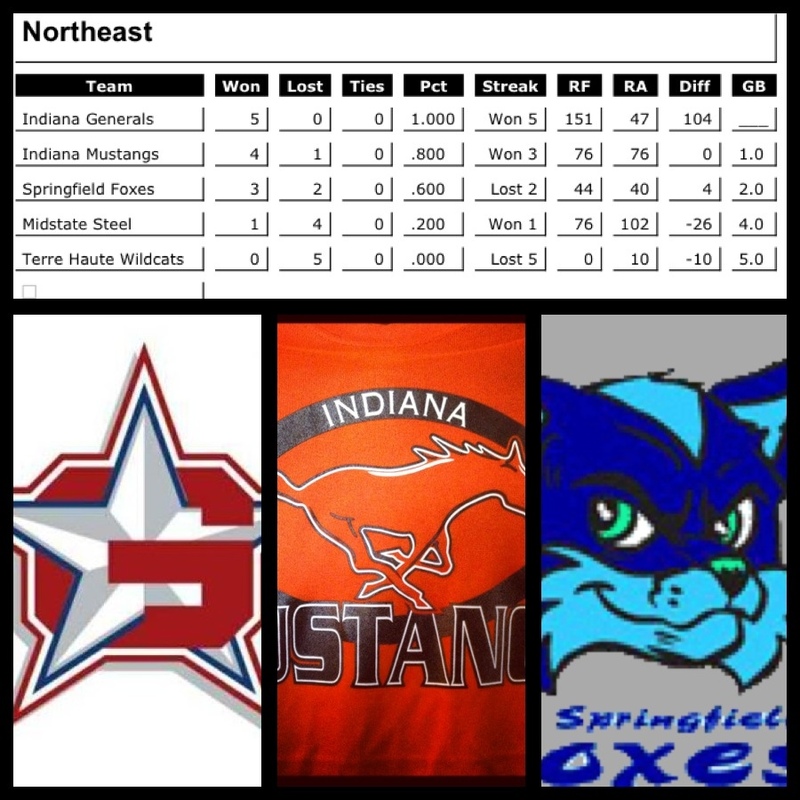 With the game scheduled against the Terre Haute Wildcats already forfieted to the Mustangs’ advantage, the team only has two remaining games, both on the road — this week against the Springfield Foxes (3-2) and the regular season finale against the Indiana Generals (5-0). The Mustangs will be battling the Foxes this weekend in Springfield to hold on to 2nd place in the Eastern Conference (the Mustangs has the tie breaker against the Chicago Mustangs (4-1)) and set up what could be an epic division and conference regular season finale with the Generals on September 14th in Indianapolis. The Mustangs are looking to gain the top seed in the conference with wins over both the Foxes and the Generals, giving them homefield advantage throughout the playoffs. First on the agenda, the Springfield Foxes. After winning their first three games, the Foxes have dropped the last two (including a close one against the Indiana Generals). The Foxes will be coming out hungry and still have a chance to land a high position in the playoff picture. The Mustangs will have to be in playoff mode this weekend against the home squad. What should be a very good game that will shape the post-season will kickoff at 7 pm CDT at Sacred Heart-Griffin High School Football Stadium (1601 West Washington Street, Springfield, IL 62702).